As lawyers from Japan, the only State that has ever suffered the Atomic Bombings, and as global citizens, we submit the following recommendations to the NPT Review Conference. 1.Every government and civil society must achieve a "world free of nuclear weapons" by 2020. 2.Every government immediately commences negotiations leading to a Comprehensive Nuclear Weapons Convention (NWC). 3.Every government reaffirms the illegality of the use or threat of use of nuclear weapons. 4.Nuclear weapon states immediately make a commitment to the negative security assurance to non-nuclear weapon states. 5.Every government extends Nuclear Weapon Free Zones. (1)The Atomic Bombs dropped on Hiroshima and Nagasaki in August 1945 brought a "hell on earth" to the victims (called "Hibakusha"). We cannot know all aspects of the hell, because the victims who died at the moment had no opportunity to talk and the survivors cannot help facing their mental destruction if they try to tell their experience. (2)In addition, the damage still lasts even after 64 years since the Bombing. The Hibakusha are still suffering their physical and psychological damage such as trauma of the hell on earth and "A-Bomb Disease" caused by radiation. Nuclear weapons continue to give unbearable agonies to the humanity. (3)Nuclear weapons are the ultimate weapon that we must never use under any circumstances. This should be the core of our thinking and action. (1)In 1996, the International Court of Justice (ICJ) stated that "the threat or use of nuclear weapons would generally be contrary to the international law. However, the Court cannot conclude whether it would be lawful or unlawful in an extreme circumstance, in which the very survival of a State would be at stake." Nevertheless, our perspective is that nuclear weapons, which kill humans massively, indiscriminately, and cruelly without distinction between combatants and non-combatants, are contrary to the international humanitarian law under any circumstances. (2)In 1963, a Japanese court ruled that "the atomic bombing by the United States was contrary to the international law" at the case where the Hibakusha sued Japanese government. (3)In 2007, the "International People's Tribunal on the Dropping of Atomic Bombs on Hiroshima and Nagasaki" concluded that the former US President Truman and other defendants were guilty for war crimes and crimes against humanity. (4)It has already been recognized at the ICJ, Japanese court, the "International People's Tribunal" that the use of nuclear weapons violates the international law. (1)The victims of Hiroshima and Nagasaki have led the movement to abolish nuclear weapons with the desire of making themselves the last victims of this agony. They also have fought at the courts against Japanese government, who has attempted to underestimate the damage of the Atomic Bombs as much as possible. This is the "A-Bomb Disease Recognition Trial." (2)In 1954, the H-Bomb test in Bikini committed by the United States fired the movement for the prohibition on A- and H- Bombs in Japan. During this Review Conference of the NPT, delegations of thousands of people have gathered in New York with six millions of petitions. 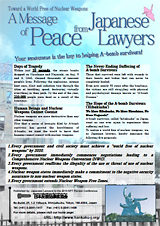 (3)We have also made many efforts as lawyers, in cooperation with the Hibakusha and civil society, in order to achieve a "world free of nuclear weapons." (1)What we should do now is not only the prevention of nuclear proliferation but the abolition of nuclear weapons. From the beginning, the NPT is an unfair treaty that permits the monopoly of nuclear weapons by the nuclear weapon states. The ICJ also stated that it is a legal obligation derived from the Article 6 of the NPT to conclude a negotiation leading to nuclear disarmament. (2)The "Model Nuclear Weapons Convention" has already been proposed and the resolutions of the UN General Assembly have called for the early commencement of negotiations leading to an NWC. (3)We believe that "nuclear deterrence" that accepts the necessity of nuclear weapons is an obstacle of the "world without nuclear weapons." (4)Let's get over the nuclear deterrence, build mutual confidence, extend Nuclear Weapon Free Zones, and realize the total prohibition of nuclear weapons as well as the ban on use.